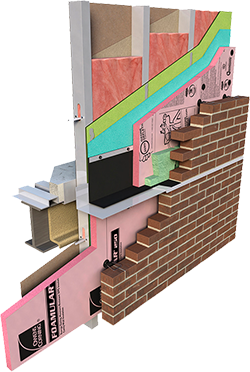 INSUL-DRAIN® board is a FOAMULAR® extruded polystyrene (XPS) product that incorporates the features of insulation, drainage, and protection board in a single product. It’s easy to install, without the need for special tools or equipment, and the product’s compressive strength and long-term moisture resistance properties mean years of reliable performance on below grade foundation walls even under extremely harsh conditions. Precision-cut channels drain water from vertical foundation walls while completing the total insulation envelope.